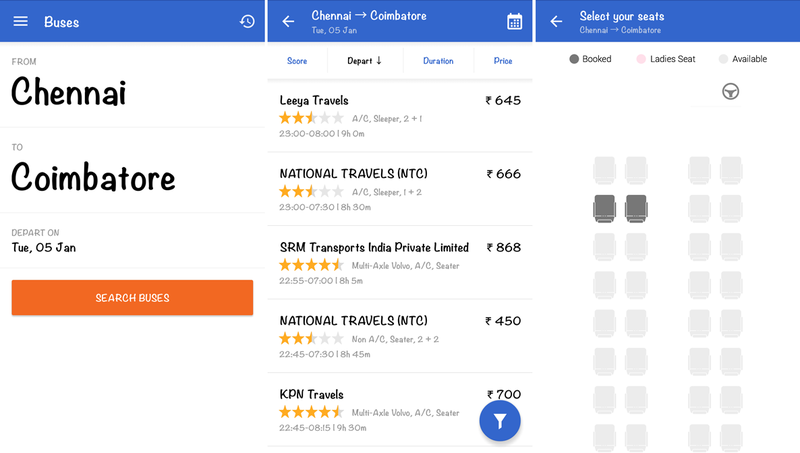 At the first glance Cleartrip is yet another app with which you can book hotels, flights and trains. However there's something that sets its apart! Firstly, yes, its a regular app that helps you book tickets & hotel. 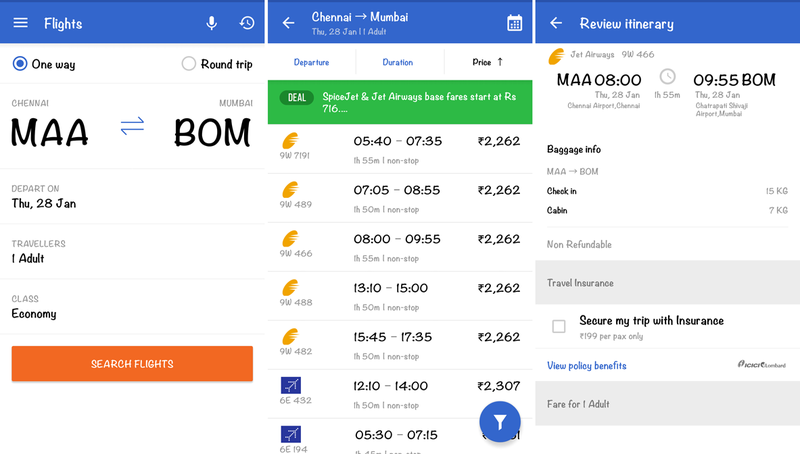 In all Buses, Trains & Flights sections, it begins with a simple UI to select the From & To locations, one way or round trip, number of travellers, class and the date. 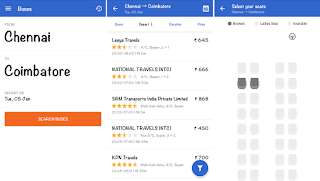 It lists the available buses, trains & flights with the price & time details, and availability status as well in trains. The train section is connected with the IRCTC account, meaning the ticket booked there can be accessed here and vice versa. Once a suitable bus, train or flight is selected, after going through the regular options for meals & insurance, payment is processed. The section for Hotels, lists out hotels of the selected city with TripAdvisor ratings and reviews with all info incl food availability, wifi, AC, Gym, Bar, 24 hrs check in facilities etc. Upon giving dates, it checks availability and goes through the payment process. 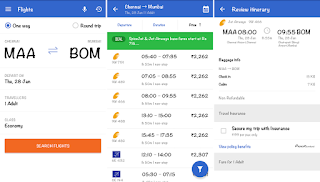 Now comes the 2 very special features of ClearTrip which makes this stand out among other trip planning apps - Activities and Weekend Getaways. The opening page of the Activities section itself is very inviting. Its shows a man paragliding on blue skies with the word 'Activities' between him & his chute! GPS predicts the city you're in which you may change easily. A grid layout lists out the various genres of activities like Sailing, Culinary, Heritage Tour, Biking, Camping, Kids and the list goes on and on and keeps changing in accordance to the city you select. On selecting a section, it lists out the various activities within that genre listing according to price. On selecting one, it gives complete details on the activity incl dates, duration, details like what's the package inclusive of, group/solo etc, prices, map and details about the organizers. Selecting the date and number of people takes to the payment process. The Weekend Getaways section's opening page lets you decide the home city, dates and number of people. It then suggests the possible nearby destinations, where one could drive or ride (not 'fly') which could a perfect getaway from busy, hectic city life. Again, at a glance, it looks like a list of hotels. However on a closer look, it has 3 major categories here - destinations, drive time and experience. Destinations lists of the possible places which are good to be considered as a weekend getaway from the specified city. Either 1 of these places could be selected to shortlist the hotels in that place or we could just skip over to the drive time. Drive Time from just 2 hrs to 10+ hrs. Experience is the most important section here. It segregates the places into the experience that it can provide like Wildlife, Hillstation, Beach, Adventure etc. Upon shortlisting using these 3 categories, few hotels are listed out. Selecting any of these hotels gives complete details about the hotel with facilities that it has, images and TripAdvisor ratings & reviews etc after which it goes to the booking & payment process. Only trouble with this Weekend Getaway thing, it gets force closed on my Android often. 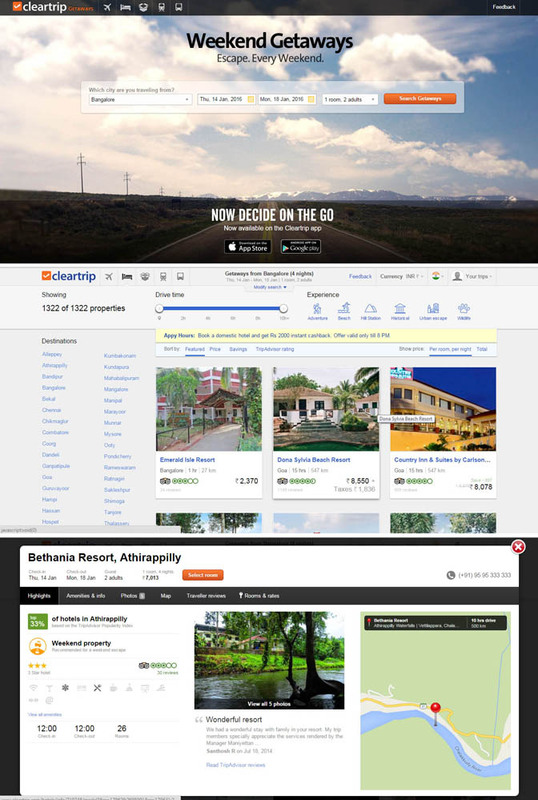 ClearTrip is also available as a website accessible from PC & Tablets, as well as an App downloadable from Google Play Store, iTunes & Windows Store. I use a One Plus One phone with Cyanogen 12.1 OS built on Android Lollipop. I experienced the app on this this phone. So, I don't know if its any different on iOS, Windows and other versions of Android. This is especially helpful for people who are travelling for the first time in a country they barely know. I love that we can rely on apps for travel now. Thanks for sharing details about it! Wow, Cleartrip seems like a one-stop app that a traveller needs. I like how technology allows one to be efficient, even with travel planning. Thanks for sharing this app, gonna check it out!! This really takes care of all your travel needs. It covers so many modes of travel and transportation. this app sounds really useful, but at the same time it covers so many aspect it's kinda confusing. will still check it out to judge for myself. thanks for sharing! This seems a bit complicated just reading it off the page. I am interested to actually downloading this app and trying it out to organize our next family trip. Looks like a useful App for traveller like me. Its like a one stop center or hub i can book and check my travel itenarary. If only I know about this one week ago! I was booking flights for my boss and had to go through a big hassle when I was booking it! thanks for that - we are about to begin travelling for ALL of 2016 so we will defintiely for check this out - looks very good ! wow. this is really helpful. thanks for introducing this to me. Although I've never heard of this app before, it sounds very interesting to me. There's so much you can do with it and as someone who travels a lot, I would definitely benefit from this! I must check this out.